I have met many other pilgrims on my journey. I think of my family, my friends and the Sisters I have loved and lived with who have been as Christ to me. I remember Cecily Saunders and Therese Vanier at St Christopher’s Hospice who encouraged me by letting me see how Christ’s love and light shone through them in their love and care for their patients ~ and also to me! At Taize I met Brother Roger and his smile is imprinted on my heart. Like the two Disciples on the Emmaus Road, perhaps I have not always recognised the Pilgrim Christ who walks with me wherever I go. 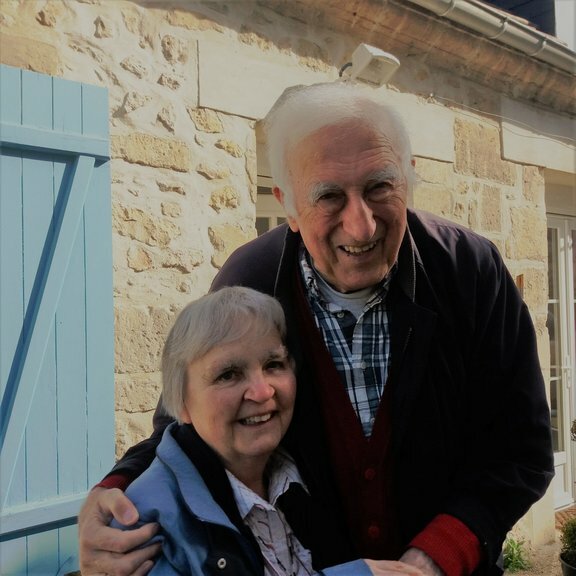 This week however; Holy week, on Monday until the Wednesday I made a pilgrimage to Trosly in France to meet Jean Vanier. There, like the two Emmaus Disciples, my eyes were opened and I recognised the Risen Lord smiling at me in everyone I met. “You are precious in my eyes and I love you.” Those words were the recurring theme of our pilgrimage. Brother sister let me serve you, let me be as Christ to you. Pray that I may have the grace to let you be my servant to. We are pilgrims on a journey. We are travelers on the road. We are there to help each other walk the mile and share the load. When Jean invited Philip and Raphael to join with him in Community in 1964, he explained to them that they were to be a Community of equals sharing with each other their own personal giftedness. All the time I was there, Ivan and the Community, by their smiles and willing service shared their giftedness with me. I have always found it a chore to say the Rosary aloud with a group, but after supper it was Ivan who led Elena, Kevin and me for just one decade of the Rosary. It was a beautiful experience. Ivan slowly and prayerfully said the first half of the Hail Mary in French. Elena recited the second half in English so that Kevin and I were able join in. The next morning Kevin and I went to see Jean Vanier for half an hour before Mass. I rang his bell and he came out to meet us with arms outstretched in welcome. Once again, as with Ivan, as Jean reached out to welcome me I knew that I was ‘at home’ and I knew in a real way what the prodigal Son must have felt like! Jean is so easy to talk to and he wanted to know all about us. He commented on my ‘northern accent’. When I told him that it maybe was still a trace of Barra he was full of interest and told us that one of the first residents of the Community L’Arche in Inverness was ‘a staunch Catholic from Barra’. L’Arche Communities are very much centered around the Eucharist. L’Arche in Trosly have Exposition of the Blessed Sacrament every day from seven o'clock in the morning until ten o clock each night. Kevin and I were able to just sit in the beautifully simple chapel and be still. I asked Jean to tell us what Eucharist means to him. Kevin was using his mobile phone to record our time with Jean, so I will share verbatim what Jean shared with us. It is important particularly as we get older to find Jesus in communion. 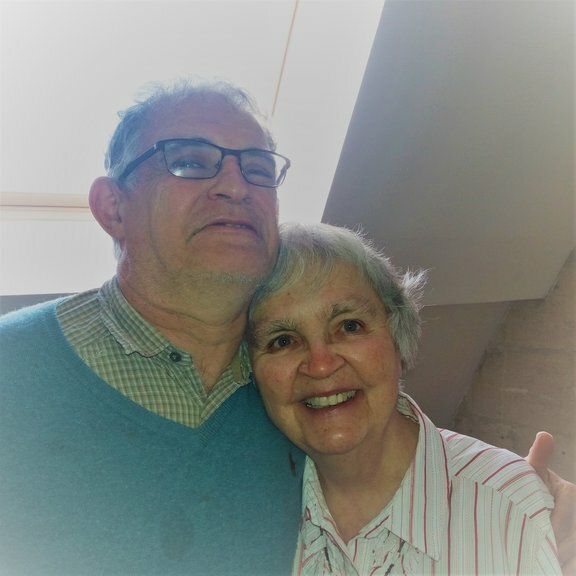 Communion is a beautiful thing, because Jesus says “whoever eats my flesh and drinks my blood lives in me and I live in that person” The secret of communion and what we want to live in L’Arche, is to be in communion one with another. It is a beautiful word to be in communion and to be in communion with Jesus and to live communion, - and that is the mystery. The host is there to be eaten and we eat it so that Jesus can live in us. Adoration is the recognition of that. The great thing of the Eucharist in Adoration is to adore the humility of Jesus. The whole secret of Jesus is his humility. He washes our feet. It is an amazing thing and that is why in a way Peter lost his head. He had always been respecting Jesus as the one who was doing miracles and announcing the truth - sometimes angrily, and so on. So Peter could only see Jesus as someone “up top!” Jesus kneels down revealing who he really is. Jesus is not just the one to answer our prayers. He is there to wash our feet, - to call us to stand up and to be like him. 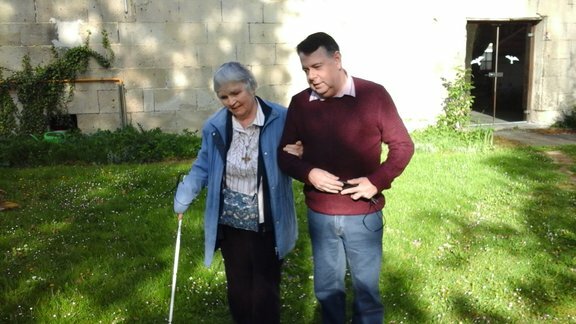 I was able to share with Jean the paradox of how my sight loss has become my greatest gift. He understood exactly what I meant and he said to me: ”What is important for you, is to lose the eyes of the head but to always have the have the eyes of the heart, - and that’s your secret”. After lunch we were on our way to Cuvilly. 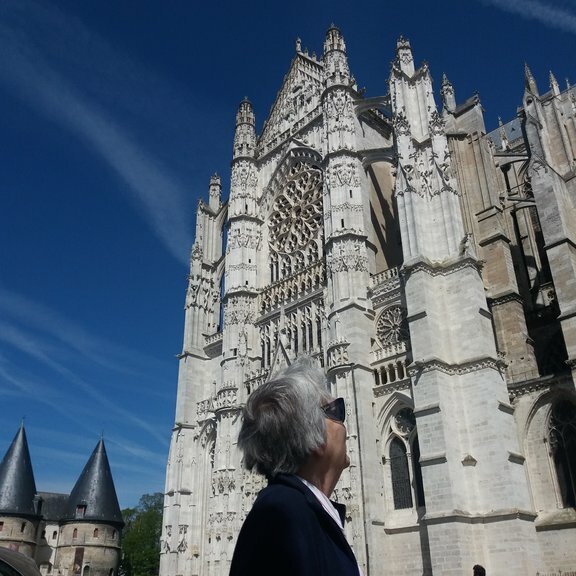 Another pilgrim, John, had joined us for our pilgrimage to Cuvilly, because he had heard us talking about St Julie and her words,Ah qu’il est bon le bon Dieu. The road passed through parts of the Oise Forest and as we bowled along in the car, I thought of how Julie had so very often walked those very roads. As we crossed over the bridge of the River Somme, I found it hard to believe that this beautiful countryside had been the place of such terrible devastation during the Great War. My mother’s two brothers, James and John died there. When we reached Cuvilly, Sr Georgette was waiting to welcome us with real English tea (bags!) John, from San Francisco, was intrigued when he saw the picture of St Julie on the dining room wall. He said, St Julie has a smile! 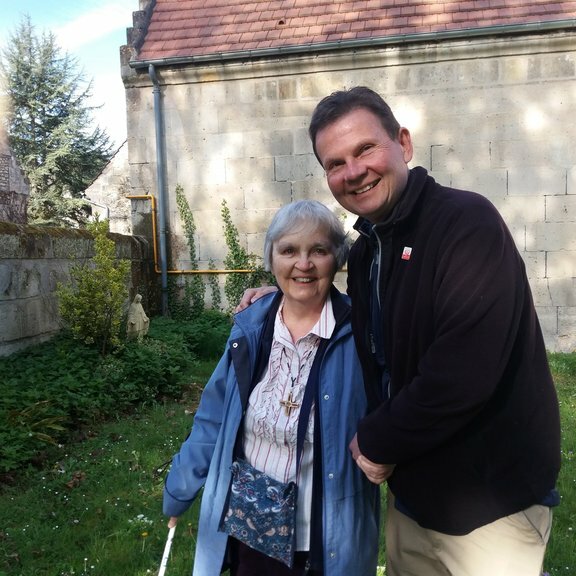 I don’t ever remember seeing a picture before of a saint who has a smile!” Sr Georgette told that when Julie died, the people of Namur said, “The Smiling Saint has died!” Kevin and John both said that Sister Georgette has the same lovely smile as St Julie. Sister took us down to the Little Chapel and we had time to leave in St Julie’s care all those we loved. 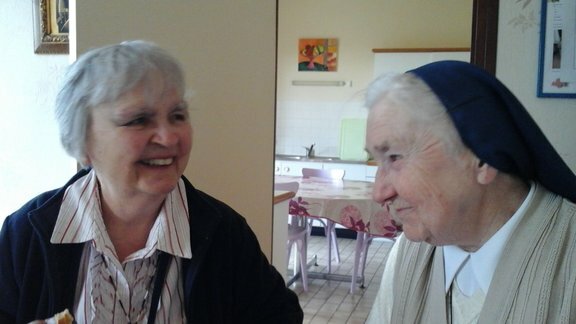 Sr Georgette lived in Bastogne for most of her life. Kevin and John were fascinated when she told them the story of the Sister in Bastogne who was killed whilst praying for the safety of the Community and of the town in the oratory. The sisters were eating the midday meal when, all of a sudden, a shell exploded in the street. The sisters hurried to the cellar and Sister Emmanuel, the superior of the community, went to pray in a temporary oratory in the cellar. A shell fell on the pavement outside the coal cellar. A piece of shrapnel crossed the cellar, went through the wall behind the tabernacle, then through the ciborium and the tabernacle door, and mortally struck Sister Emmanuel in the heart. The hole in her vest is a witness of the wound, and the shrapnel damaged ciborium is now in Namur in the Heritage Centre. 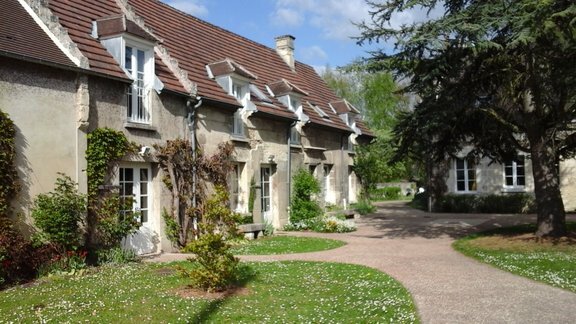 On our way back to Trosly we called in at the L’Arche Community in Compiegne to visit Philip who now needs nursing care. Philip with Raphael, who died several years ago were the first L’Arche members to join Jean in 1964. I thanked God for my rather basic French that enabled Kevin and John who had very little French to communicate with Philip. Philip and I also managed to sing two songs in French for them! – ‘ Cadet Rousell a trois maisons.’ and ‘Sous les ponts de Paris’. Maybe it was a bit gobbledegook French, but we all enjoyed it! We left Trosly on Wednesday morning after less than 48 hours there. As we left the Community, they said, “Next time you come, stay for a week!” What a tremendous, never to be forgotten privilege Kevin and I had shared with so many beautiful people. Jean Vanier has helped me to understand the humility of Jesus in a new way. Today, the first Wednesday after the Resurrection, the Gospel reading is the Emmaus story. As I listened to the Gospel I was aware of the humility of the Risen Lord who walks beside us; not in his glory, but as one of us. I am blessed to have seen him in the people I met with last week. I thank him that my eyes have been opened to see him more clearly in the people who walk with me in everyday life.